With offices strategically located throughout the continental US, Bennett’s owner/operators are the backbone of our company. For more than 37 years these professionals have set the industry standard for safety and quality transportation services. As a CSA compliant company, we take pride in our safety culture and the our accountability to the motoring public. Our owner/operators are a very large part of this accomplishment. Every year we recognize our driving force’s outstanding safety and loyalty efforts with several incentives including apparel, service awards and safety bonuses. In addition, an elite group of owner/operators have earned the right to join the President’s Million Mile Club for driving a million safe miles without a preventable accident. Many of our owner/operators have driven even more than two million miles in careers that often span more than 30 years. 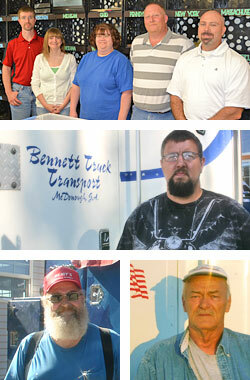 BTT Owner/operators have the opportunity to be selected from their peers to serve on Bennett’s Driver Advisory Board. In addition to providing valuable input to make Bennett the best transportation provider, our Driver Advisory Board members administer claims arbitrations and the Driver Relief Fund. The Driver Relief Fund is a voluntary fund supported by BTT owner/operators for the benefit of their fellow Bennett drivers. The fund is administered and disbursed, based on need, by the Driver Advisory Board to help drivers due to injury or long-term illness. They have also helped when drivers have lost their homes to fire, tornado or other disasters.